Everyone worries about privacy these days. As corporations and governments devise increasingly sophisticated data gathering tools and joining Facebook verges on obligatory, concerns over the use and abuse of personal information are undeniable. But the way privacy functions on the virtual frontier of the Internet is only a subset of the fascinating ways we work to achieve it throughout our everyday lives. In "Islands of Privacy", Christena Nippert-Eng pries open the blinds, giving us an intimate view into the full range of ordinary people's sometimes extraordinary efforts to preserve the border between themselves and the rest of the world. Packed with stories that are funny and sad, familiar and strange, "Islands of Privacy" tours the myriad arenas where privacy battles are fought, lost, and won. Nippert-Eng explores how we manage our secrets, our phone calls and e-mail, the perimeters of our homes, and our interactions with neighbors. She discovers that everybody practices the art of selectively concealing and disclosing information on a daily basis. This important balancing act governs a wide range of behaviors, from deciding whether to give our bosses our cell phone numbers to choosing what we carry in our wallets or purses. Violations of privacy and anxiety about how we grant it to each other also come under Nippert-Eng's microscope as she crafts a compelling argument that successfully managing privacy is critical for successfully maintaining our relationships with each other and our selves. 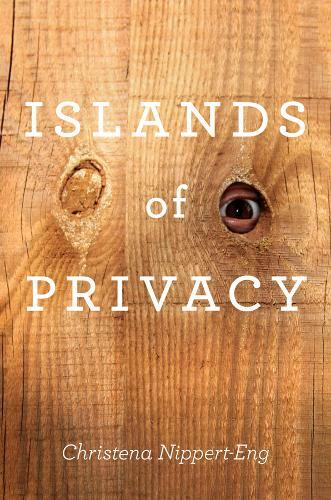 Roaming from the beach to the bank and from the bathroom to the bus, Nippert-Eng's keenly observed and vividly told book gives us the skinny on how we defend our shrinking islands of privacy in the vast ocean of accessibility that surrounds us.